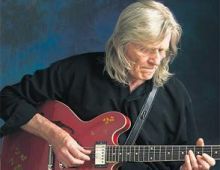 The career of Henry McCullough cuts through just about every conceivable facet of rock music, and touches upon some of its most glorious moments. Henry's first brush with the realIy big time - as part of Joe Cocker's Grease Band. Tours and albums followed quickly, including an appearance at Woodstock and a lengthy period of work in the States. Breaking with Cocker, Henry and The Grease Band continued to mune a gritty blues vein that made them a live favourite that has rarely been equalled. He found himself auditioning for a gig with ex-Beatle Paul McCartney. Henry, along with Denny Seiwell, Denny Laine and Linda McCartney were the first - and many say best incarnation of Wings. He embellished the single 'My Love' with a graceful solo that is one of the all-time guitar gems and shows once and for all the expressive power of the instrument. At one Wings session at Abbey Road when Pink Floyd were in the studio next door, Henry made a spoken contribution to the classic Dark Side of the Moon.